The 2019 B2B Marketing Exchange is less than a month away! Soon, B2B marketers from all over will gather in Scottsdale, Ariz. to get inspired and prepared to tackle the latest trends, market conditions and buyer realities with gusto. Last week, we asked our sponsors, speakers and attendees to participate in a #B2BMX LinkedIn takeover. The rules were simple: share a short video detailing why you’re excited to attend #B2BMX, what you hope to learn and why you think others should attend. Unsurprisingly, the B2B community delivered and posted creative, insightful and funny videos to help us create some buzz for the event. Below is a compilation of some of our favorite entries from the takeover. 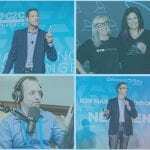 Keynoter David Meerman Scott is excited to share ideas for how to build fans in a B2B business. Keynoter Brian Fanzo is pumped to talk about marketing, collaborating and connecting with Millennials. Kellie de Leon of The Mx Group is looking forward to leading a workshop on buyer-centric marketing. Jay McBain is ready to be a first-time speaker at the event; he’ll be presenting a highly-anticipated session on channel marketing. Darryl Praill of VanillaSoft is gearing up to get out of the snow and into sunny Scottsdale, where he will talk about sales accountability, digital strategy and more. The team at PureB2B enlisted Lego Voltron to help make some noise about their Lunch & Learn, where attendees will get ideas for how to improve lead conversion rates. PathFactory is up for two Killer Content Awards — including the B2B’s Choice Award — so it’s no surprise Marketing Programs Specialist Evan Doyle is stoked for this year’s event. The team at Demand Gen Report is ready to exercise their B2B skills and thinks everyone should work on “fitness” event into their calendars.